Has your organization ever considered an employee suggestion program? While many companies have tried and failed, employee suggestion programs remain an incredible avenue to employee engagement and innovation. 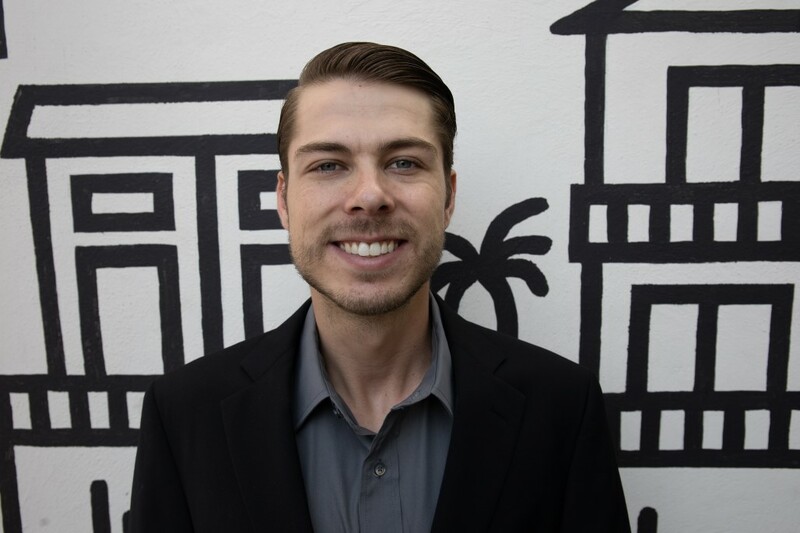 A carefully constructed employee suggestion program launched with organizational commitment, clarity, and ongoing communication can positively impact your employee motivation and enthusiasm. Employee suggestion programs deliver value for your customers. Employees working hands-on in various aspects of your organization know what customers want, many times more than senior-level employees. One example of this is Winnebago, the RV maker. An employee suggestion program was implemented to add and improve speakers in their vehicles. This was extremely important to customers. It would not have happened if an employee had not suggested it to management. Employee suggestion programs boost employee motivation and morale. When an employee suggestion program is properly executed, teamwork is encouraged. Employees are inspired to work together to collaborate on innovative suggestions. If employees see that a suggestion program is implementing the innovative ideas of employees, it increases organizational loyalty. If employees know they can make a difference and understand they are being heard, they are more likely to be loyal to the organization which lowers the employee turnover rate. Employee suggestion programs increase your organization’s profit. 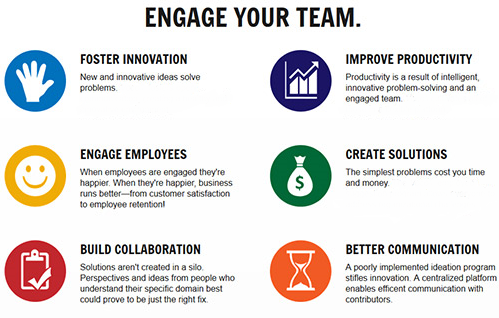 Ideas made by employees can innovatively increase company revenues. A great example of this would be the 3M company. 3M is known for sticky notes. The idea for the widely used sticky note came from an employee suggestion. Since 2013, 3M has made $3.47 billion in revenue solely from the sticky note. Employee suggestion programs can reduce organizational costs. As well as increasing revenue, organizations can reduce expenditures by taking employee suggestions into account. For example, British Airways launched a staff suggestion program in response to a challenging economic environment. One employee’s suggestion was able to save them roughly $750,000 a year in fuel costs. While increasing revenue is a primary concern, sometimes reducing costs can be just as powerful. Employee suggestion programs can increase employee happiness and sense of purpose. It can provide a sense of autonomy. The employee suggestion program gives employees the feeling they can make a difference in the organization with their ideas and input. A suggestion program can give employees the feeling that they are developing themselves and are improving at their job. This feeling of mastery improves confidence and increases individual innovation and engagement. The program also gives employees a feeling of higher purpose. Employees feel more empowered towards their work. There are several things that must happen for an employee suggestion program to be successful. There must be a commitment from leadership to the program. If employees do not believe that senior leadership has bought into the program it is likely to fail. Senior leadership must advocate for the suggestion program and make it known across the organization that it has value. A senior manager must take reins and be the administrator of the suggestion program. Having your organization’s senior decision makers promote the program will encourage your employees to make suggestions and feel like an important part of the organization’s success. This will increase motivation and employee engagement. Organizations must establish guidelines for your employee suggestion program. One possibility might be to provide topics for suggestions. Another possibility could be driven towards specific departments or categories that are important to your organization. Other ideas include cost savings, quality, productivity, process improvements, revenue generation, and morale improvement. Always include an open-ended section for out of the box thinking. An employee suggestion needs to be more than just a complaint. The suggestion must provide some detail about how the suggestion can come to life and improve the organization. The suggestion process should be simple to execute for the employee. The organization should create a cross-functional team that reviews the suggestions. This team will review, recommend, and implement the helpful and innovative suggestions received through the program. The review process should be timely. The team members should be prepared to present the valuable suggestions at scheduled meetings. The choice of the team members should be based on your organization’s structure and culture. 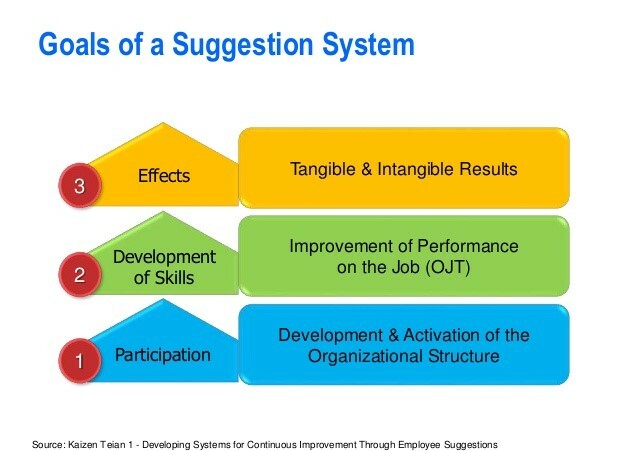 The process for the employee suggestion program should be openly communicated throughout the organization. It is important to share all the processes and goals that your organization is trying to accomplish with the program. The biggest failure of employee suggestion programs is allowing suggestions to fall through the cracks. If this routinely occurs employees will be considerably less energized to make suggestions. If they do not have the belief the suggestion will be heard why will they make the effort? This is a guaranteed failure for an employee suggestion program. While it is important to respond to suggestions in a timely manner, the decision-making team should not rush their answers. Ultimately employees just want to know what is going on with their suggestion. This can be done by simply sending an email saying, “I like the idea of your suggestion, but it is going to take a couple of months to discuss with the rest of the decision makers”. Having an administrator for the employee suggestion program is crucial. A senior manager must take reins of the suggestion program. Having your organization’s senior decision makers advocate the program will encourage your employees to make suggestions and feel like an important part of the organization’s success. This will increase motivation and employee engagement. Incentives and rewards can be important for staff members making suggestions in the program. Whatever your organization chooses for rewards and incentives, they must be clearly established at the start of program implementation. A common example, of how many organizations reward a suggestion, is if it creates cost savings or revenue increases, the employee receives a bonus. Often this bonus is a percentage reward of the value. Another idea is to have a standard reward designated. Other ideas for incentives and rewards are merchandise with your organization’s logo, gift certificates, lunch with a chosen manager, or a quarterly award dinner. The quarterly award dinner is used by Richard Branson with his Virgin companies. Award meeting recognition has been found in studies to be very effective. Creating rewards and incentives energizes your staff which will end up in more beneficial suggestions. Your employee suggestion program should emphasize suggestion’s quality over quantity. The organization should encourage employees to offer solutions, not just complaints. The thought behind the suggestion program should be innovation and progress. When an employee suggestion is implemented your organization may want to publicly recognize the employee who made the suggestion. It is always good to ask permission of the employee before you publicly acknowledge their suggestion across the organization, as it may make them uncomfortable. Making suggestions optionally anonymous can be important, especially if the suggestion is rejected. If this is not offered employees may be afraid or embarrassed to submit out of the box ideas. While not having an anonymous option may discourage certain employees not to make suggestions, it can ultimately encourage employees to publicly stand behind their idea. On the other hand, there may be specific situations occurring in certain organizations where having suggestions left anonymously is beneficial. There are other considerations when implementing an employee suggestion program. Should managers reviewing suggestions be incentivized as well as those making the suggestions? Should customers and vendors be included in the suggestion program? Should there be a path for promotion for employees who make innovative and useful suggestions?